Teachers, students and union leaders rally against Smarter Balanced tests outside the state Capitol. Mary Quinn-Devine says the state-mandated tests she is required to give her students in North Haven are pointless. 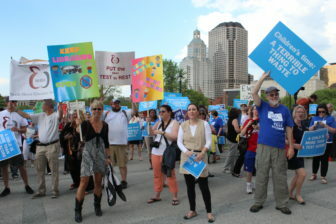 So on Tuesday she — and about 500 teachers, students and union leaders — traveled to the state Capitol to rally against the state’s standardized test, known as Smarter Balanced. The list of grievances is long against this new test that is aligned with the controversial Common Core State Standards: it takes too much time out of the school day, the computerized test means school libraries are closed for instruction for weeks at a time, and teachers get the results during the summer — too late to help identify where students need extra help. 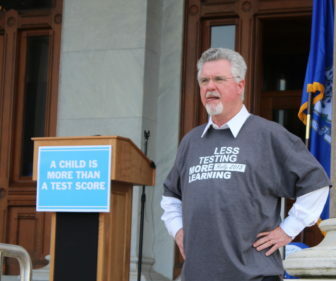 “We aren’t sure what the current test is measuring,” said Liz Devine, a teacher at Hall High School in West Hartford and the 2009 National Social Studies Teacher of the Year. The leader of one of the state’s teachers’ unions flanked by Republican and Democratic legislators. But top state lawmakers are backing the tests, and told the Mirror they do not support the state’s retreating from the Smarter Balanced Assessment Consortium (SBAC) tests. “I think the Smarter Balanced test is the right test. A lot of work has gone into developing that and, you know, I think that we are actually seeing success with it being given and making real progress,” Gov. Dannel P. Malloy, a Democrat, said Friday. “That test does show to be robust and valid,” said Rep. Andy Fleischmann, D-West Hartford, House chairman of the legislature’s Education Committee. The state’s teachers’ unions are hoping to change their minds. They plan to launch a second round of television advertisements next week to put pressure on legislators to repeal the use of the Smarter Balanced tests. It also might prove useful that the former speaker of the House, Chris Donovan, and former Senate President Pro Tem Donald Williams are on their side as employees for the state’s largest teachers’ union. They were at the Capitol rallying next to teachers. The unions found allies in Republican leaders at the rally. 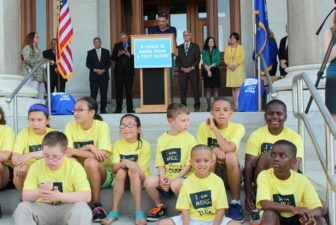 Senate Republican Minority Leader Len Fasano spoke at the rally, as Rep. Gail Lavielle, the ranking Republican on the legislature’s education committee, applauded. Former House Speaker Chris Donovan at the rally. More Republican legislators attended the rally than Democrats, who are the majority in both the House and Senate, and are typically more aligned with union causes. Federal law requires students to be assessed annually, and the state’s answer to that requirement is the SBAC test. The unions want legislators to set up a task force to recommend a new test for the State Board of Education to consider. That test, they propose, would consist of three short, 25-minute tests that students would take throughout the school year, called “progress-monitoring” tests. Teachers say such a test would better help them identify early where their students are struggling and allow them to intervene. The follow-up test would allow them to see if things are improving. Many districts already administer these progress tests. Fleischmann said that he has been told by the State Department of Education that none of the progress tests would fulfill the federal testing requirement. “None of those [testing] companies have had a robust evaluation that could fulfill the federal requirements…They’re just not there yet,” he said. Mark Waxenberg, the executive director of the Connecticut Education Assocation, said the state would be well served by setting up a task force to explore that issue in greater detail. ‘We’re not against testing. We’re against this test,” said Mary Quinn-Devine, a teacher from North Haven. “It’s premature to say that federal law wouldn’t allow this,” he told the Mirror. With the legislative session coming to its deadline to adjourn for the year, legislators have three weeks to pass legislation setting up a task force to overhaul the state’s testing system. The amount of testing is also an issue. In addition to the federally sanctioned test, many districts must also administer tests required by their municipalities. There currently is no statewide inventory of how many tests are administered or when. The SBAC tests will eventually be used to help grade teacher performance and rate schools, and some people worry that doing away with the test would do more harm than good. 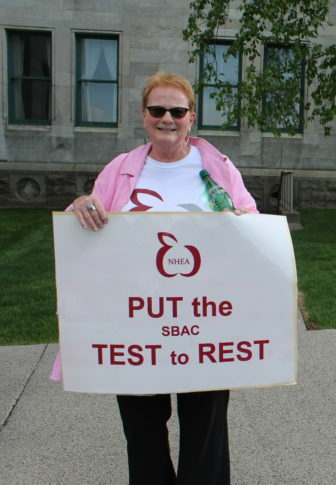 A teacher opines about the SBAC test.